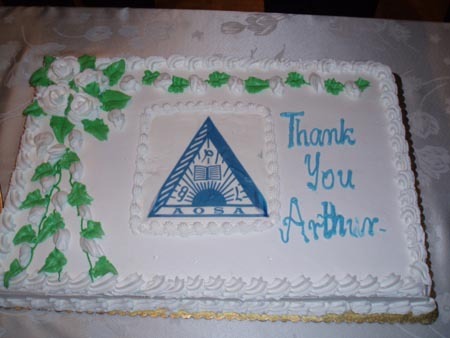 Arthur Asfar has been President of our Organization for over 25 years, and he is now retiring from this position but will still be active in our Organization. He was recently honored for his work at our Fund Raising Dinner Dance on May 3, 2008, and was presented with a plaque and a cake for the occasion. Below is the speech given by Mr. Nakkash on May 3, 2008. Brikh Ramsho w’Shlomo Al Kulkhoun. Good evening Father John, Father Aziz, family and friends. On behalf of the Assyrian Orphanage and School Association, I welcome each and every one of you to our annual dinner dance party. As you know, last year’s annual dinner was cancelled due to events in our community. Now that we are gathered here, let me briefly note upon our history. In 1899, a few enthusiastic Suryanni men met in Sterling NJ. They had lived and seen how education helps improve people and gives them better opportunities, and since public education was almost non-existent back home, they decided to help their own people in the old country with providing funds for educating the needy. They established this Orphanage and School association which is also known as “Taw Meem Simkat”. Since then, over 100 years, our organization has grown and has been an ally of education for our own people in Turkey, Lebanon, Syria, Jerusalem and Iraq. Today, our schools, monasteries and orphanages are the recipients of the funds that you all contribute to through dinner parties, Christmas mailings and donations. We have many people in our community who have participated or benefited from the work of this organization. Our Late Bishop Samuel Yeshue was at our TMS in Adana Turkey in 1919 while Malfono Faulous Gabriel, Malfono Hanna Salman, Malfono Thomas Khoury, to name a few, have been part of the TMS School in Beirut. We have printed a small brochure describing the organization and placed it on the tables for you to read. I would like to take this opportunity to thank the Board of Trustees of the Church of Virgin Mary in Paramus for allowing us to use this beautiful hall. Also, I would like to thank our Bishop Sayedna Afram Kerim for his support. Sayedna was unable to join us tonight due to a prior engagement in Florida, but wishes all of us a good evening. We also thank all of the people/you who helped us make this night possible and hope you have a great time with the music and food. 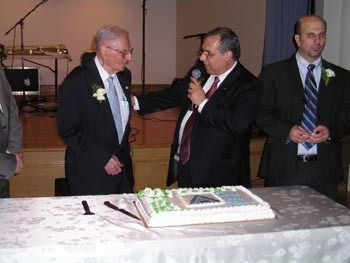 Before I move forward with tonight’s program, we are celebrating and honoring Mr. Arthur Asfar’s dedication and service to this organization and the Suryanni community here and overseas. Mr. Asfar has spent over a quarter of a century as president shepherding this organization, involving the entire community. Earlier this year, Mr. Asfar decided to step down as president of this organization and new officers were elected. 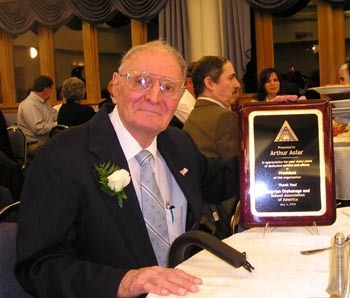 Through out his service, Arthur had the will and energy to keep this noble cause alive. 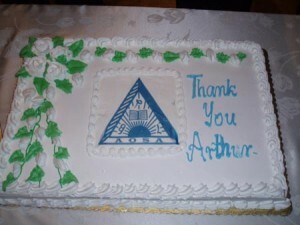 I had the pleasure and honor of working with Arthur for the past 3 years and I’ve been very impressed with his dedication in reaching out to people in our community here and thousands through out the United States. Our Christmas mailing goes out to over 6000 people in all of the 50 states. We have received very positive feedback from many of our donors.